Durango Crew is among the best in its class as displayed here in True Blue Pearl Coat. Everything about the Durango demands a second look, from the huge 18-inch aluminum wheels, the signature chrome grill, to the beefy All Wheel Drive stance of this machine. Under the hood sits a 290-hp 3.6L Pentastar V6 tethered to a five-speed Automatic that can tug up to 6,200 pounds down the road and still supply you with near 25 mpg. As you can see, the interior is full of features to fulfill drivers needs as well as passengers demands. Inside you will find an incredible dash mounted media center, back up camera, Bluetooth technology, and a rockn'' Alpine sound system with 10 speakers. When you choose the Rear DVD Group your passengers will enjoy the rear DVD entertainment system and the Innovative fold and tumble seats provide lots of combinations that maximize the utility of the Durango providing plenty of room for the family vacation. Seating is flexible and adaptable for all of life's needs. Durango does an excellent job of protecting you with advanced safety features like four wheel ABS, hill start assist, and all-speed traction control brake assist which makes driving in ever changing road conditions a breeze. Roomy, tough and sleek-looking, it has a perfect combination of interior space and safety features. 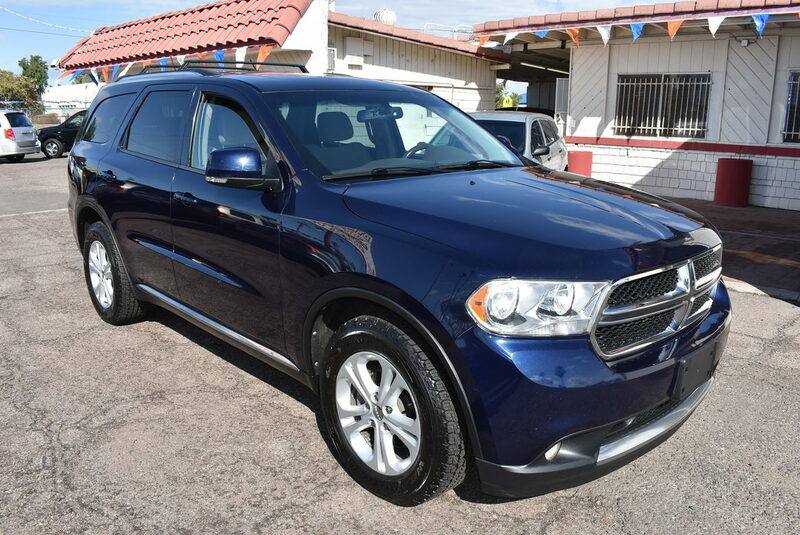 You have found the Durango for you! All you have to do is print this page and call us Now... We Know You Will Enjoy Your Test Drive Towards Ownership!